In the southeast United States, the woodpecker that gets all the attention is the one with the red cockade. Rightly so I guess, it is, after all, a federally endangered species and limited to a few fragments of pine barrens habitat across the south, but we in Dixie have remarkable numbers of other woodpeckers too that visitors from other parts of the continent, and the winder world, may find interesting. When Corey visited North Carolina at the end of last year he was as impressed by another picid, one with a more extensive scarlet pate, as much as our little specialty, and as I speak to birders from parts north, they have been similarly impressed by the ease in which I can find this second bird. It’s not common in any place, but it’s regular, and even abundant, in the right places. 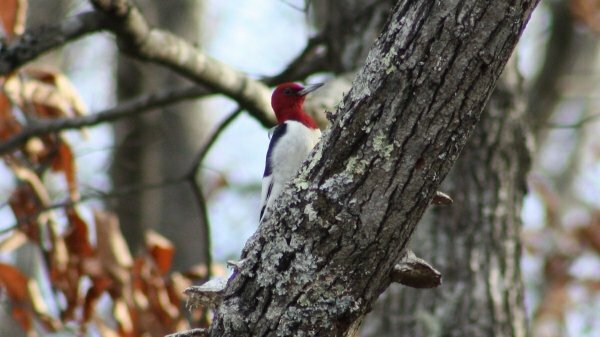 I’m speaking of Red-headed Woodpecker, on the short list of nearly every birder’s most loved species and the very manifestation of economy of color. Three shades, like most woodpeckers, but in big blocks, without bar or stripe to mar an otherwise perfect depiction of black, white, and red. Red-heads, more than any other regular woodpecker species in the south aside from the federally endangered one, seems to be associated with a certain type of habitat in this part of their range. More often than not I find them in open woodlands, particularly if its wet. It’s certainly not as specific as the Red-cockaded Woodpecker by any means, but it’s the type of place that seems to be particularly prone to sprawl in this part of the country and always under threat as oak snags are removed as safety hazards and seeps are drained for foundations. It’s not a unique story by any mean. In fact, it’s the great tragedy of rapid development; that these unique little spots can not only be utterly transformed, but so easily, into something significantly less special. Woodpeckers remain, of course, but they’re the common and comparatively pedestrian Red-bellied and Downy Woodpeckers. Fine birds, but I don’t think I’m talking out of turn when I say they’re not nearly as exciting as a Red-head. So when I see them, as I do on occasion at a few well-established sites, it’s a definitely a banner day. It’s not all bad. I wouldn’t have written this post if it was. The point I’m trying to make here is while the Red-headed Woodpecker is subject to the same kind of pressures that so many other species deal with, it’s actually doing pretty well here in the south, the core part of it’s range. While Woodpeckers are generally non-migratory – the Flickers are being notable exceptions (for reasons other than their seasonal travels, too) – the Red-heads will move around a bit from season to season. Birds in the northern part of their range do often head south, with many finding there way to the hardwood swamps and sloughs of the southeastern US where they can concentrate in remarkable numbers in nomadic flocks in some places. One such site is the the Lumber River IBA, a nice patch of fairly extensive bottomland hardwood forest in southeast North Carolina, where counts of Red-headed Woodpeckers well into the triple digits have been made in late winter and very early spring. Can you imagine? Red-heads flocking like blackbirds? Chattering away like siskins on a feeder everywhere you look? These significant seasonal aggregations, discovered relatively recently, are of interest to not only on a state level but nationally as well. Any time a bird of any species congregates in numbers like this it’s important to monitor them for two pretty self-evident reasons. 1) The species is likely quite dependent on this place either as wintering or crucial stopover habitat and 2) if it’s important to this one species, it’s likely equally important to other, less charismatic, species. In the case of the Lumber River IBA both cases are almost certainly true. Not only are there state wildlife biologists interested in knowing just when and why these congregations of Red-headed Woodpeckers can found there (with help from the Wake County Audubon chapter, of course), but other times of the year Lumber River IBA hosts nesting Mississippi Kites and Anhinga and likely significant populations of wintering Rusty Blackbirds too. Unfortunately, like so many other sites in the eastern part of this state, it’s under-covered leaving too little quantitative data as to the real significance of the park for the Red-headed Woodpeckers and others, but what evidence is promising and suggests that the southern United States has more to offer passionate piciphiles than then little Picoides borealis. That is, if large concentrations of Red-headed Woodpeckers do anything for you. If not, than I’m afraid there’s no saving you. It’s somewhat of a rarity here in NJ, but can be found annually in the right habitat in winter. They do breed in a few small pockets too. It’s one of my favorite birds. I remember seeing one as a kid with my dad through this giant Celestron telescope we used to use while birding. My dad also tells a story of one time where there were 5-6 in one tree, but I don’t remember it and I think it may have just been a Vietnam flashback. Prothonotary Warbler and Red-headed Woodpecker. I saw both, and to this day it is hard to say which one impressed me more. I think if I saw a triple digit number of Red-headed Woodpeckers in one day I would pretty happy to die at that moment. Great post about a great bird! @Patrick- They are fabulous birds. My local patch, Mason Farm, has a family group that hangs out so I can regularly see 5-6 at one time. @Jochen- Definitely one of the best birds in North America, by virtue of charisma and stunning looks. They’re absolutely up there with Prothonotaries. @Corey- Yeah, me too actually. I’d love to get down to Lumber River IBA but it’s a long way away in a very rural part of the state and even once you’re there, access is difficult. It’s funny, but I always think of this as a Midwestern bird, not a southern bird. They’re very common in bur oak savanna and gallery forest on the Great Plains–so common, in fact, that “redhead shoots” were still being held just a hundred years ago to keep them from destroying wooden buildings. Unfortunately, they’re also a common roadkill nowadays. @Rick- Funny you say that, because where I went to college in northern Missouri they were rather common as well, but they were found in a completely different habitat than what I see in the south. It’s the same one you mention actually, burr oak woodlots with sparse understory, but they were as wedded to it as they are to bottomland hardwood forests in this part of the country. They’re definitely great birds to see. Everywhere I’ve birded, Red-headed Woodpeckers are highly localized, and they seem dependent on having specific conditions in place. If the acorn crop isn’t good in a particular year, they’ll move someplace else. Like in the south, the Red-headed Woodpeckers here mostly stick with wetlands. Great post Nate and good job for highlighting a bird that surprisingly does not get enough attention. Thanks for posting about one of my all time favorite bird species and making me aware of it occurring large roosts. Sounds like something from a birding dream! Great post! I never saw that bird when I lived in Minnessota. RHWP is still a bird that is missing from my life list. My daughter and I saw a woodpecker while walking in my area, in Fountain Valley, CA. We had never seen one aroud here before and were wondering what it night be. It was small and almost all black with same white markings. We could not see any red, but then we were looking up at it, so if there was red the spot must have been very small. We are sure it was a woodpecker from the bill and the actions of it. Thank you and have a blessed day. 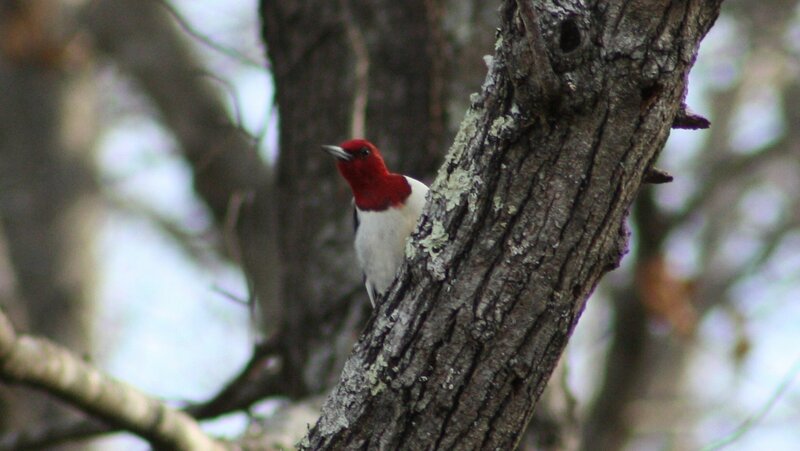 I live in Tupelo Ms and the time first I saw a redheaded woodpecker or should I say when I first time heard him I knew he was special then I saw him and I knew he was rare and beautiful.